There is a proportional relationship between the size of the element and its frequency. Try to keep the dimensions of the element down to a minimum, taking into account your frequency/ beam spread and the search/ scan index criteria. Using a flat faced transducer the element dimensions will determine the size of the area that can be inspected in one pass. Where focused transducers are used the size of the element will be proportional to the depth of the search required. When selecting the correct frequency for any given application there is balance between three deciding variables, PENETRATION, SENSITIVITY & SMALL FLAW DETECTION. The lower the frequency, the greater the penetration, and as the frequency increases so does the ability to detect small flaws. Broadband, high frequency transducers are ideal for accurate thickness measurement, checking thin wall materials and detection of very small near surface defects. Resolution is a product of damping and bandwidth. The bandwidth describes the frequency range over which a transducer will operate. Highly damped, broadband transducers are responsive to a range of frequencies above and below there centre frequency. For example: A 5MHz broadband device could operate effectively at a range of frequencies from 1.5 to 8.5 MHz, where as a narrowband device may operate from 4.0 to 6.0 MHz. The sound emitted from an unfocused transducer will resemble a cylindrical mass. This sound wave will not remain as a straight cylinder, but will start to spread as the sound travels through a material. This reaction is known as beam spread or beam divergence. Beam spread is measured from side to side. Beam divergence is measured from the centre line to the outside edge of the beam. Beam spread is usually determined by a combination of transducer size and frequency. The beam spread from a low frequency transducer will be greater than that of a high frequency transducer. But as the diameter of the transducer increases beam spread will reduce. Depending on your application beam spread and beam divergence can be greatly reduced or even eliminated completely by using a focused transducer. 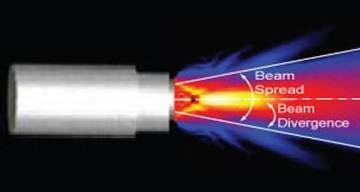 Spherically focused crystal & lens transducers dramatically increase sensitivity to small defects by focusing the energy from the sound wave to a specific point. This style of transducer is particularly useful for accurate measurement of thin wall materials. When used in high speed surface testing, spherically focused transducers minimize noise to signal ratio and increase power significantly to expose very small defects. Cylindrically focused crystal & lens transducers are extensively used in the testing of pipe, tubing, bar stock and other comparable cylindrical objects. A correctly configured transducer enables you to minimize unwanted beam spread, improve scan index and can greatly increase testing speed and sensitivity. Every variety of focusing is available on all Camasonics immersion transducers. Please specify the focal length required, taking into account the water path and the thickness of the material to be tested. When a focused transducer is requested, a description of your requirements is beneficial to ascertain the most effective configuration in relation to your defect standard.